IDC & App Annie just released a very interesting report on the state of mobile gaming applications. 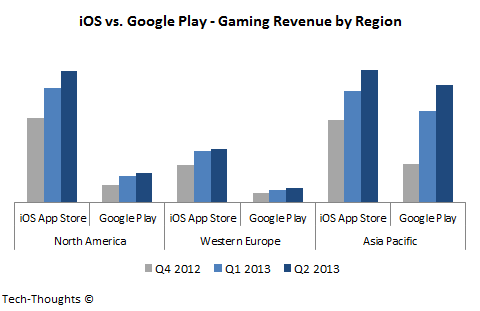 The report details consumer spending patterns on gaming apps for iOS and Google Play. For each platform, it also gives a breakdown of consumer spending by region. Let's take a deeper look at these figures. 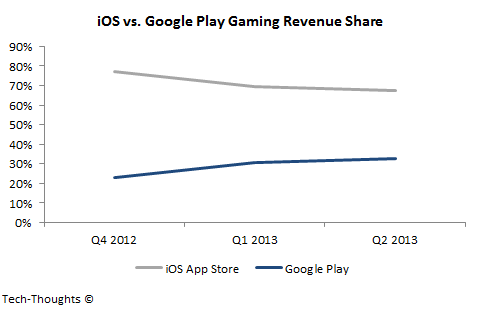 The chart above shows the revenue share of the iOS App Store and Google Play within the gaming segment. I based this on normalized revenue data from App Annie/IDC's latest report and their previous report from Q1. Since Q4 2012, the iOS App Store's revenue share has dropped from 77% to 67%, while Google Play's has grown from 23% to 33%. This pattern has primarily been caused by Google Play's strong revenue growth - Google Play has grown by about 150% from Q4 2012 to Q2 2013, as compared to 55% growth for iOS over the same time frame. The chart above shows relative revenue patterns for each platform broken down by region. As we can see, the iOS App Store leads in every region, but in very different ways. iOS' revenue dominance in North America is fairly clear, helped by the pricing patterns prevalent in the region. iOS leads in Western Europe as well, but by a smaller margin. However, in Asia, platform leadership is not as clear. In Q4 2012, iOS' gaming revenue was double that of Google Play, but the gap has closed quickly and the two platforms are now neck and neck. While it is clear that the largest chunk of Google Play's revenue gains have come from Asia, the reasons for these gains aren't particularly obvious. Globally, China is the largest market for Android devices, but as per Informa more than 40% of those devices come without access to Google Play. Therefore, overall Android gaming revenue from the Asia-Pacific, including that from third party app stores, is likely to be considerably higher than iOS. Interestingly, App Annie states that Japan and South Korea are the two largest revenue generating regions for Google Play. This trend ties in with Flurry's recent study which claimed that Samsung Android users (probably dominant in these regions) were more similar to iOS users as compared to other Android users. It is unsurprising that the two largest brands currently own customers with the most favorable demographics. Having said this, most readers know that I don't expect the Apple & Samsung duopoly to sustain. I'm currently researching the impact of modular competition on leading consumer brands to substantiate this further. Another interesting pattern is that download volumes for Google Play are about 10% higher than the iOS App Store, which means that Google Play's revenue per download is much smaller. This pattern ties in with a recent post from Benedict Evans, who showed that higher per device engagement or revenue may not be enough for developers to maintain an iOS-first strategy if overall volume from Android devices continues to significantly outpace iOS devices.